Scaling up can have real impact and is worth the effort. Great ideas are easy to spread. Planning support (through materials, discussion ideas) is helpful to stimulate meaningful conversations. 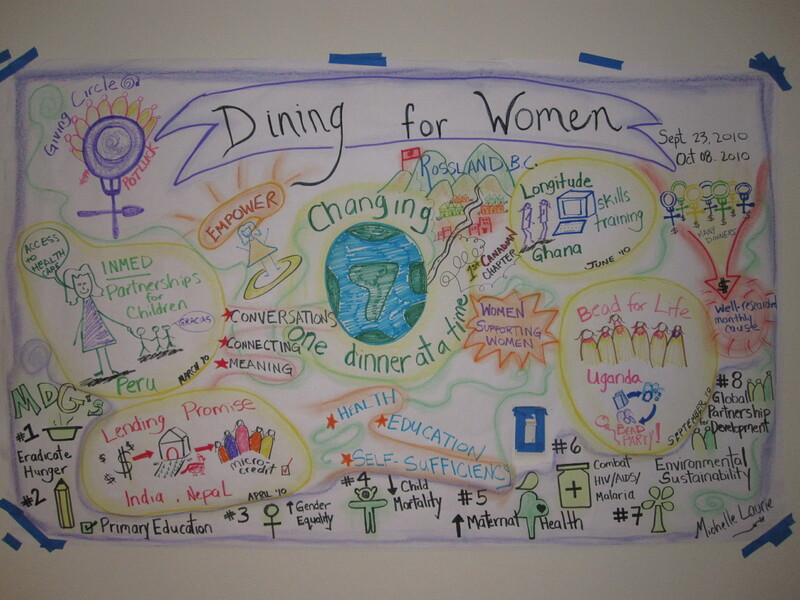 Four themes of Dining for Women that took place during the past year. Rossland is the first Canadian chapter of Dining for Women. Dining for Women is rooted in supporting the Millennium Development Goals. Reasons why women in Rossland are excited about participating. Some of the topics and themes we discuss at our potluck dinners. After spending a month off-line, I was convinced it is essential for one’s health. The neck and shoulder aches were gone, I read more in the papers and had conversations over breakfasts rather than over emails. In East Africa, I appreciated the big landscapes, time that stood still and poli poli (slowly slowly in Swahili) way of life. Once back to my ‘real’ world, I found out from a friend on Facebook how to fold bottom sheets (with the help of a You Tube video). This has always been a mystery for me so indeed I appreciated the quick and very interesting information. For me, the simple discovery epitomized the wonderfully bizarre information era we live in. This morning I am reading in Wired Magazine about a company that specializes in creating in demand online videos. It’s about making the cheapest, fastest content for Internet users that are searching through their 4000 videos and articles published every single day. Likely they are the ones who solicited the bed sheet folding video. Pretty amazing. I wonder what else I might learn about if I type my questions into google? My work takes me into the world of technology as well as the world of people. I enjoy the slowness off-line but I also depend on the Internet, media and globalization for my livelihood. How else could I live in the woods and continue to connect, share and collaborate on projects all over the world? This morning I am reflecting on the irony of all these different realities. I may stay at this computer and catch up on emails and work. Or I may head back to the fireplace and watch the flicker from the couch with hot tea in hand. Both are good…but…the fireplace wins this morning. Last night I learned about different home heating options such as biomass, fossil fuels and geoexhange (moving heat from the ground into buildings). It was a great evening of learning from an expert as well as my neighbours. It was part of a monthly series of discussion nights I organize called Green Drinks. Green Drinks in my small town is about getting together over drinks, learning more about an environmental or social topic and stimulating conversation. I try and find a resource person to kick off the discussion and provoke us to think beyond what we might know. The fun is really in meeting new people and hearing their thoughts. Last night we held the evening as a conversation café where we had three rounds of conversation after a fifteen minute introduction by our speaker. People rotated through tables with one person remaining at each table throughout to act as a host and share what the people in the earlier rounds had to say. After thirty minutes everyone gathered together in a bigger conversation to ask other questions and share a bit about what their tables spoke about. I use Conversation Café techniques in my work but was hesitant to try it in an informal, casual setting. It was certainly a more structured green drinks than normal but when asked if they liked the format, there was an overwhelming amount of support to keep it up. I am coming to the conclusion that forced networking techniques from the KM world are great tools for both inside and outside the workplace….even in small rural communities where you think everyone already knows each other! The photo above is of edible berries found in the forests’ of Guyana. I took the photo on a field trip in 2006 where we were looking at restoring degraded forests for improving poor people’s access to resources as well as improving biodiversity. There were definitely things I didn’t like about my work…some of which are also above. Spending one’s life on planes, away from ‘home’, living as an ex-pat, and the list goes on….is not what I wanted. Still, I am nostalgically thoughtful on this rainy morning as I sip coffee in front of the computer in my comfortable house nestled in the mountains. The ski hill in my town is a local amenity as well as a tourist attraction. While the locals love skiing they also love to complain. When riding the chairlift or in the bar, I often hear about how the mountain could improve things and how they should appreciate local pass holders more. I can’t say who is right or wrong, however I see an opportunity for community engagement by the company who owns the resort. Coincidentally, I was drinking a beer next to the owner last week. The topic of engaging the community came up and he invited me to a public meeting where I would see exactly how they are doing this. The subject was a proposed golf course at the base of the ski resort. Several people in town are concerned, mostly due to it’s location in the town’s watershed. While the situation is quite interesting, this blog entry is about process. meeting time was 6:30pm – exactly when you should be dining with your family. What can one really learn about a country after only 3 days of exploration? I would certainly feel comfortable saying that it is a country of extremes. From the peaceful tranquility of Ha Long Bay, where islands of towering cliffs with luscious greens dot a calm of sea blue. To the streets of Hanoi where chaos seems to reign. Still people are calmly moving within it and I found the rhythm penetrates. Indeed, after wondering if crossing the road was actually taking life into my hands, I eventually found the spaces to meander through amongst the non-stop sea of motos, cars, cyclos, and other moving objects. The photo below is moving traffic! Amongst the extremes, one can see and sense the history rooted in a people who have fought for their country’s independence and ideologies over centuries. From a knowledge management perspective, I found the words of Confuscius, whose teachings and philosophy have deeply influenced Vietnam, very relevant in todays world. He wrote, “I hear and I forget, I see and I remember, I do and I understand”. In my short three days, Vietnam has shared with me a few of its faces, its history and its teachings. It has reinforced my own beliefs in the need to learn from experience. For example, chaos isn’t always what it appears. Moreover, learning by doing is often necessary to truly understand. That extends to understanding chaos as well as more generally. Last thoughts before catching my plane back to British Columbia: I recommend the movie Indochine if you are interested in the recent history of Vietnam and seeing more of the magnificant Ha Long Bay.